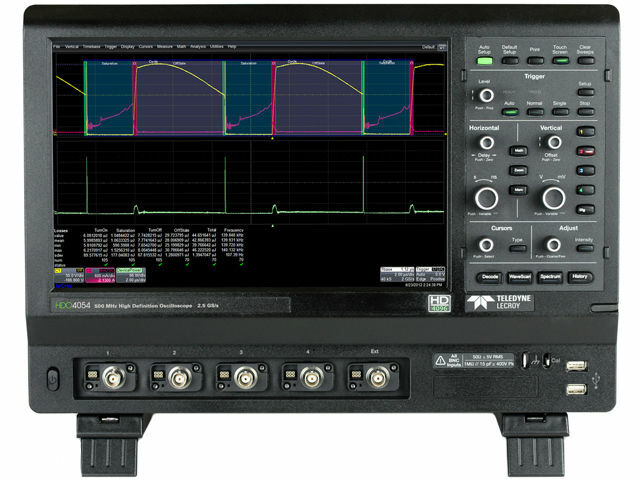 The LC-HDO4024 is a device from TELEDYNE LECROY, an American manufacturer of high quality digital oscilloscopes and protocol analysers. It's a 4-channel oscilloscope with bandwidth up to 200 MHz and memory record length of 12.5 Mpts/ch. Its HD4096 technology is unique for, among others, its high vertical resolution of 12 bit (which can be digitally upgraded to 15 bit). Another notable feature is its large (12.1") TFT touch screen which supports 1280 x 800 resolution. Its modern interface enables intuitive operation of the device and provides quick access to its advanced functions. HDO4K-L – memory record extension to 25 Mpts/ch. It also features a number of original solutions such as: WaveScan (signal search), LabNotebook (report generator) and History Mode (waveform playback). These functions allow users to identify, isolate and export signal anomalies, and quickly solve issues. input impedance: 1 MΩ/15 pF.